Bang Saray Villa. 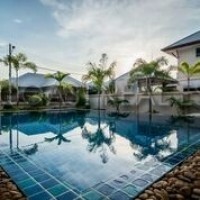 This luxury 2 bedroom villa has been built from start to finish by an experienced ex-pat, local to Bang Saray for many years. He always builds to exacting standard, and always going that little bit extra rather than trying to cut costs and corners. This property has a large electric gate, and 2 metre perimeter wall for security, and privacy. From the outside you have a covered 2 vehicle carport driveway, landscaped gardens, and a large 11m x 4m private swimming pool with a 6 seater Jacuzzi area. The pool features a granite edged overflow system for effect. There is also a large outside patio so that you can enjoy the fantastic climate and the views of the tropical gardens, but be able to enjoy it in the shade from the sun. The house has a European standard 6 metre kitchen, and an outside kitchen for preparing some of the stronger smelling meals. Both huge bedrooms have their own en-suite private bathrooms, with the master bedroom also featuring a grand walk through wardrobe. Make an appointment to see this quality house for yourself.